Snoring is an uncomfortable fact of life that many have to deal with on a nightly basis. From chronic stress and lack of sleep to strained relationships, there are problems associated with snoring that can reduce your quality of life. Other health problems associated with snoring include high blood pressure, heart disease, stroke, obesity, and erectile dysfunction. Snoring can severely impact mental health in addition to physical health. For years, the impact of poor sleep on mental health and wellness has been widely recognized. Scientific research in recent years has established a correlation between snoring and mental health, and with depression in particular. What this means is that those who snore are more likely to be depressed, and those who are depressed are more likely to snore. The directionality of this relationship has not been established, meaning that it is not officially sure if snoring causes depression or the reverse. However, most scientists agree that the most likely direction of causality is that snoring causes or worsens depressive symptoms. Depression presents in different ways for different people. It is much more than simply “being sad” or not feeling as happy as one normally would. In fact, some of the most common symptoms of depression are fatigue, irritability, and difficulties with memory, concentration, or making decisions. These are commonly reported symptoms of many people with sleep apnea. If you are always exhausted, easily annoyed, and unable to think the way you did before, these may be signs you are depressed. 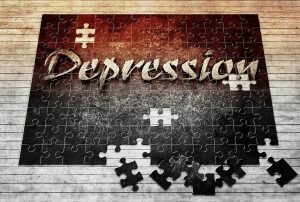 Other symptoms of depression include feeling hopeless or helpless, overeating or undereating, no longer enjoying the things that you used to, or thoughts of suicide. Imagine never feeling rested, no matter how much or how little you sleep. Anyone would feel horrible under these circumstances. Yet for those with moderate to severe snoring problems, this is the reality of their everyday lives. When you snore, you may not complete the normal cycle of sleep, and never reach the deepest part of rapid eye movement or REM sleep where the body rests, restores, rejuvenates, and relaxes completely. This means that when you wake up, you still feel exhausted, and must go on with your life with a continual feeling of exhaustion and worsening fatigue. Fatigue increases stress and is a major symptom of depression but may also in part be a cause of depression and other mental health disorders as well. By treating snoring, you will be able to get a good night’s rest and let your body and mind be restored from the pressures and stresses of everyday life. When you are rested, you will feel more relaxed, more energized, and less worn down by life. This alleviates the worst of the depressive symptoms and allows you to recover. No matter how bad your snoring is or how much it is impacting your mental health, there are solutions. First of all, it is important to talk to your physician to rule out physical causes of snoring or other diseases, such as obstructive sleep apnea. If you have sleep apnea, depending on the severity, it may need to be treated medically or with a device such as a CPAP machine. However, most cases of snoring can be resolved yourself at home on your own. Many people benefit from the use of a mandibular advancement device such as the customizable SnoreRx mouthpiece. Different mandibular advancement devices have different features, so it is worth trying out a few at different price points to find what works for you. Still, others cannot tolerate a mouthpiece but find that a My Snoring Solution chinstrap works well for them. This works similarly to a mandibular assist device to adjust the jaw but has the additional benefit of being less invasive on the face. No matter which anti-snoring method you choose, you may have to try one or two before you find a solution that truly works for you. Regardless of which method works, the evidence is clear: solving the snoring puzzle is key to your physical health as well as mental well-being. By taking efforts to stop snoring, you alleviate symptoms of depression and ensure optimal mental health related to your sleep habits. For increased happiness and life satisfaction, better sleep, and better overall health and quality of life, the answer is clear: stop snoring today!